Va Piano tasting room in the Historic Davenport Hotel. The small, brightly lit room next to the Isabella Ballroom inside the Davenport may appear as though it's always been occupied by Va Piano Vineyards and its white marble countertops, but it's actually Spokane's newest winery tasting room. Gonzaga graduate and Va Piano owner Justin Wylie describes the opening of the new tasting room as something that was just meant to be. While Wylie and his wife Liz were focused on their tasting room in Bend, Oregon, opening this spring, Davenport owner Walt Worthy alerted the couple about a newly available space inside the historic Spokane hotel. "I went to Gonzaga and my wife went to Eastern, so Spokane has always been a special place for us," says Wylie. "We've spent a lot of time there and we just couldn't resist making this happen." Wylie's interest in wine began during his time studying at Gonzaga's campus in Florence, Italy, during his senior year, followed by four years of making wine in his garage. He purchased land in Walla Walla in 1999 and opened Va Piano in 2005. "A lot of people think of Walla Walla as wine country, but many of our wine club members live in Spokane," says Wylie. "Both Spokane's food and wine scene are growing, so hopefully this new location will be a great service to our existing wine club members, along with helping more wine enthusiasts learn what we're all about." Va Piano translates to "go slowly," indicative of the Wylies' commitment to enjoying life while taking care of their family and vineyard, and slowly building their wine program over time. 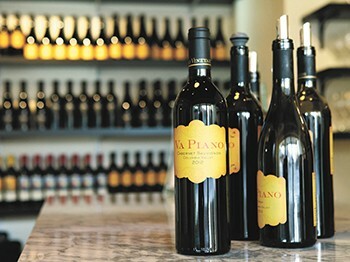 The tasting room currently showcases four different Va Piano wines, charging a $10 tasting fee that can be waived with the purchase of any bottle of wine.